You won’t be able to buy a Trinity APU and slap it into the motherboard you bought with last year’s Llano chip, however. The FM1 socket introduced in 2011 has been replaced by FM2, a similar looking socket with pins in slightly different places. 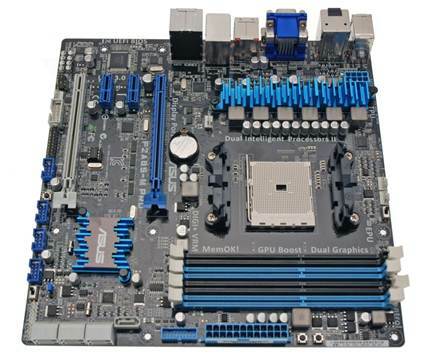 That means that, as well as having to buy a new board for Trinity, you’re not able to use first generation Fusion chips in FM2 motherboards. That could be seen as a cynical move, but AMD has committed to socket FM2 for the next generation of APUs as well as for Trinity, so for those buying new parts, there’s a modicum of future-proofing included. AMD’s A55 and A75 chipsets return this year, and they’re joined by a new high-end option, A85X. The new top-end chipset is designed for enthusiasts and those who want to use an APU with CrossFire rather than Hybrid CrossFire, and is also the only one of the three chipsets to support two PCI Express x16 slots running at 8x speed. A58X has advantages in other areas, too. It supports eight SATA 6Gbps ports (A75 supports six ports, and A55 none) and both the A58X and A75 chipsets support USB 3, with the low-end A55 chipset supporting the older USB 2 standard instead. The introduction of a new socket means you’ll have to buy a new motherboard if you’re looking to build a Trinity-based rig. However, some good news is that the cost-conscious ethos of Trinity means they’re not too expensive; models we’ve been shown, from Asus and Gigabyte, cost less than $160. The Llano part to buy was the range topping A8-3870K, so we wasted no time in locking and loading the A10-5800K into our test rig. After all, it’s the most powerful Trinity chip, and the most likely to take the fight to Intel. Its benchmark score of 0.76 is a modest improvement on the 0.7 scored by the top-end chip from last year, and it’s not far behind Sandy Bridge-based Core i3 chips, which scored between 0.77 and 0.79 in the same tests. While those older, slower Core i3 processors are still available to buy, though, Intel’s latest budget chips (Ivy Bridge-based Core i3s) returned scores of 0.82 and 0.83 in the same tests. In real terms, that means there’s very little change in the performance gap between new Trinity and Core i3 chips. An in-depth look at the benchmark scores reveals where AMD’s parts catch up to Intel - and where they fall behind. Intel’s chips are more capable in our Windows responsiveness tests: when tasked with opening and closing applications and Explorer windows, Intel silicon scored between 0.97 and 0.98, while top-end Trinity parts scored between 0.72 and 0.86. Intel-based parts pulled ahead in traditional computational tasks, too, perhaps because of more efficient Hyper-Threading. Only the Core i3s were the right side of 0.9 in our iTunes encoding benchmark. AMD’s chips caught up when their Radeon cores flexed their muscles, however: both Trinity and Core i3 chips scored above 0.9 in our Photoshop test, and the Core i3’s top score of 0.6 in the video rendering benchmark was bested by a 0.63 result from the A10-5800K. It’s in our games tests where Trinity makes its biggest gains. In DiRT 3’s low-quality test, run at 1,366 x 768, the A10-5800K sauntered to an average framerate of 78fps. That’s a big gain on the 61fps of the A8-3870K, and it’s almost double the 43fps scored by Intel’s HD Graphics 4000, its most powerful integrated GPU, and a core that’s only included in one of its Ivy Bridge-based Core i3 chips. The A10-5800K didn’t just stop there, either, and eventually scored 33fps in the high-quality DiRT 3 test run at a full-screen resolution of 1,920 x 1,080. That’s not just enough to put paid to Intel’s integrated cores; it’s enough to worry low-end discrete cards too, with the Radeon HD 6570 just one frame quicker. The A10-5800K’s good performance was maintained in other games, with an average of 48fps in the low-quality Just Cause 2 test eleven frames quicker than the HD Graphics 4000 chipset and 26fps ahead of the HD Graphics 2500 core. The mid-range A8-5600K wasn’t far behind either: it scored 74fps in the low-quality DiRT 3 test, and averaged 40fps in Just Cause 2’s low-quality benchmark. That’s still far quicker than anything Intel can muster, and it suggests that all of AMD’s Trinity APUs will be able to best Intel’s integrated cores when it comes to gaming tests, even when they’re attached to cheaper processors. The efficiency of AMD’s latest chips lends itself to smaller PCs, and Asus’ new F2A85-M Pro caters for small form-factor machines thanks to its micro-ATX form factor. The move to a smaller size, inevitably, entails compromise. There are only two PCI Express x16 slots rather than the three included on the Gigabyte and, while there are still two PCI Express x1 slots on-board, there’s no room for PCI -a problem if you’re planning to use legacy hardware. The four DIMMs still support up to 64GB of DDR3 RAM, though, and there’s still seven SATA 6Gbps ports crammed onto the smaller PCB. The backplate is similarly well-stocked, too, with the same display outputs, four USB 3 sockets and even a PS/2 port. to put together a reasonably powerful machine. There’s one other caveat, though, which is price: at $176, we’d recommend buying the cheaper Gigabyte unless you crave a smaller system. Why Is Nobody Buying PCs?